My mother used to make these when I was growing up. The actual recipe called for them to be fried in grease in a large skillet. You can follow that method if you like, I prefer them baked in the oven. They are wonderful either way, but this recipe is the baking method. You can use fresh apples or dried apples, the process is the same either way but since dried apples are already sweetened, you may want to use half the sugar. In a 2 quart pan, place apples, cinnamon, nutmeg and 1/2 cup of the water. Cook over medium heat until apples are tender and add a little extra water if needed to prevent sticking. When apples are done dissolve cornstarch in 3 Tablespoons cold water and pour into apples. Stir and continue to cook for 2 minutes until the sauce has thickened. Set aside to cool. Mix together flour and salt. Cut in cold butter and cream cheese until it resembles crumbs. Mix vinegar and water together and then slowly add to flour mixture. If dough is too dry, just add one teaspoon water at a time until you have added enough to make a soft dough. Cut dough in half and flatten into 2 round disks. Wrap each disk in plastic wrap and let sit in refrigerator for 30 minutes. When dough is ready roll out to 1/8 in thick and place small round bowl on top. Cut around the bowl to make one pie shell. Repeat process with remaining dough. Roll up dough scraps and roll out again to make more pie crusts. Place 1/4 cup of apples on each crust and wet one half of the edge of the pie crust with water to help it seal. Pull crust up and over filling stretching slightly and mash gently around the edges. Flute edges with a fork to make a better seal. Repeat process with remaining crust. 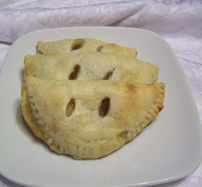 Place pies on a large ungreased baking pan (light color or cover your pan in aluminum foil). Cut 2 small slits in the top of each pastry. Brush with egg wash and sprinkle with decorative sugar or plain sugar and bake at 400 degrees for 20 minutes or until lightly browned. Let cool slightly before serving. These are also great served a la mode.